I've said it before, but in my case an old saying "shoemaker's children are often shoeless" is so true. My sister complains (and for a good reason, really) that I should wear more of my own designs, to get a conversation started and "then you could slip them your beautiful business card". Thanks sis, that reminded me of an another problem, the cards (still missing). I found this pretty-reused-striped-sturdy-cotton while thrifting some weeks ago. The piece wasn't quite large enough for a bag (it was a small-ish pillow cover) but the colors were just lovely. 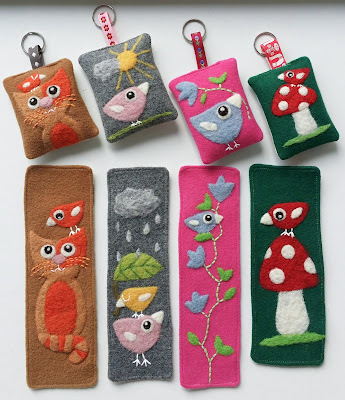 I pieced it for a few pouches and some keyfobs and needle felted the birds. And liked it even more. Then and there I decided that this set will be mine. And because it's only for me, should it lack some details? Definitely not. The following has no connection to a certain brand or their products, but I think the set is perfect because I'm worth it. 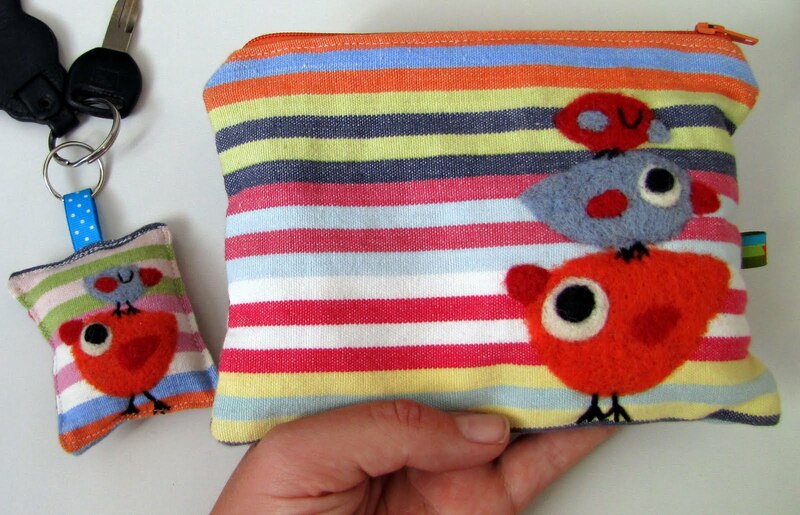 The cutest birdie-set ever, so me, (and a great conversation starter too, I'm off to hunt the business cards soon, do not worry sis! ), mission accomplished. 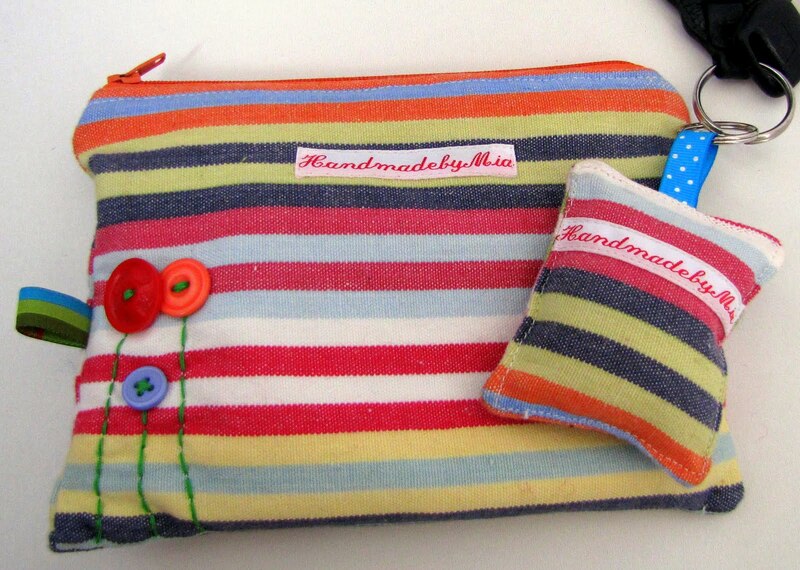 It's lovely, and about time you made something for yourself.....because your worth it! Mia you are missing an opening if you do not carry your own wonderful bags. I wear a lot of my own jewellery and many, many commissions start by someone seeing something I am wearing, asking where it is from and hey presto...a new commission. You must get also get some cards, there are lots around. You could have your dear Birdies on them? Get flaunting your wonderful creations. What a lovely set Mia and it's only right that you should have a set of your own because you're definitely worth it!! Thank you Lyn - I know :) But it always seems that something business-related gets done before my own things... But not this time! I know, and I promise to get the cards printed soon, too! I am thinking Moo-cards too with my creations, that's on my to-do-list. Happy and sunny new week and many kisses to Billy! I am a big fan of stripes, knitted and else, and wanted some for myself too, and I'm so happy with my set. Have a great Monday, and sunshine from Finland! Thank you! I promise to get cards designed, it's just my to-do-list is longer than me currently ;) But this gets done, soon! I wish you sunny days for this week! I am so happy the little package got to you and you liked it! It always makes my day to hear that, I keep worrying a bit when the parcels are on a way...Lovely to hear when they get to their destination. Hi Mia, Love this new stripey set "just" for you. 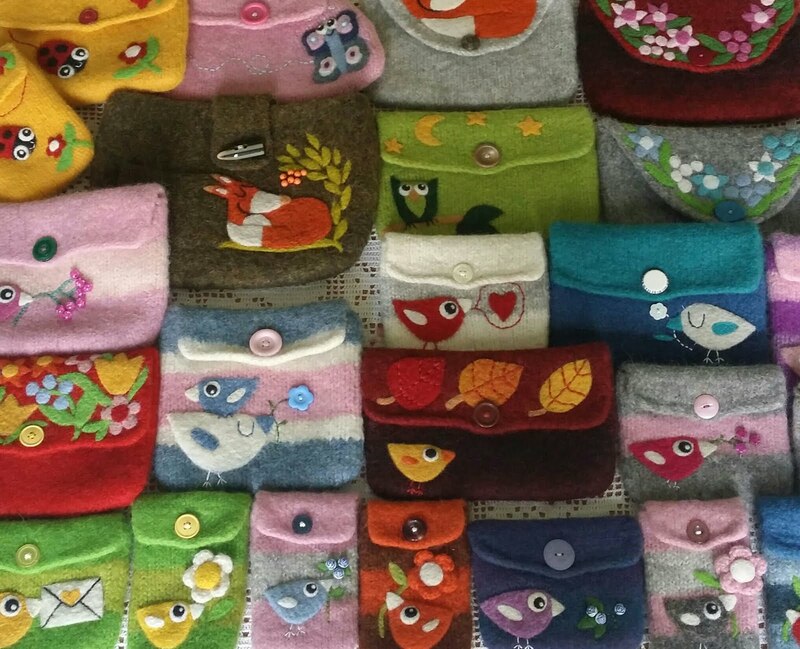 I'm happy to hear you are carrying your own pouches, bags, etc. They will be noticed!! Can't wait to see your new cards.I know you will find something original. I'll show you the cards as soon as I have them, SOON I wish! Have a wonderful and sunny new week! Hi Mia! That is a beautiful set and surely starts conversation! 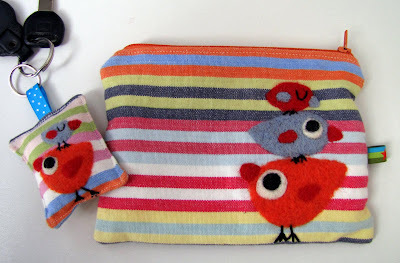 I think those happy colours with adorable sweet birds looks like you and are perfect to show your work to people! Have a wonderful and sunny week! It's lovely Mia and I'm glad you've found time to make something for yourself. I've also just read you last post and it did make me laugh as we have mice that steal our Alpine/wild strawberries. I've just panted loads more bushes and we've managed to taste a few ourselves this year. I am so happy to hear that others "battle" with similar issues and it's not just me :) And I have had taste of strawberries this year too - please see my post on Thu 21st July!